OMG-LOL! -- "Oblivious to the reality that his world is about to end!" Painter-pal Adam Licsko and I were recently tooling around downtown LA's Walt Disney Concert Hall, touching the stainless steel sheathing, inspecting the great sweeping curves, and sensing the movement apparent in those awe-inspiring forms that architect Frank Gehry created. We were continuing the conversation we'd started in my last blog -- On Painter Adam Licsko -- 'Remember Yourself!' -- about the concept of evolution as devolution and Licsko's message not to forget our humanity and to not get "sucked into technology as an agent of sleep and complacency." Studying Gehry's undulating design, I recalled that when I first interviewed Gehry, we'd met in his jam-packed office. The amiable Gehry had invited me to sit on his custom designed corrugated furniture. "Comfortable, right?" Strangely, he was right, it was. Outside his office were clusters of his young employees all happily working on computers, using CATIA software to interpret his tactile visions. He said the software allowed "architecture to do what it's supposed to do, design buildings within budget, time and schedules... in the real world." Although he was surrounded by computer workstations, Gehry admitted to being a bit of a computer illiterate. Throughout his deconstructivist career, he has been inspired by real things like the shape and movement of Koi. As an example, he grabbed some cellophane paper, crumpled it tight in one hand. He then allowed the cellophane to explode out, to unravel into life in my own hand. He explained that's how he came to imagine magnificent creations like the Guggenheim in Bilbao and Disney Hall -- utterly unique creations that explode with movement. When I asked him about his own computer, whose blank screen was covered in post-it notes, he quipped that it had never been switched on! That's Gehry a real flesh and blood creature, who uses advanced software to great economic and esthetic advantage but who was using his own desktop computer, well, as a rather clunky paperweight. No way was this brilliant codger going to lose his soul to technology. Not like the young woman Licsko read about who had walked off a pier while texting. Don't laugh, "distracted walking" is a growing health hazard. According to a government agency, more than 1,150 people were treated in emergency rooms in the US last year after accidents with handhelds. DOH! Licsko has intrinsically captured the very dangerous essence of distracted walking in his 5' x 4' oil on canvas "OMG-LOL!" 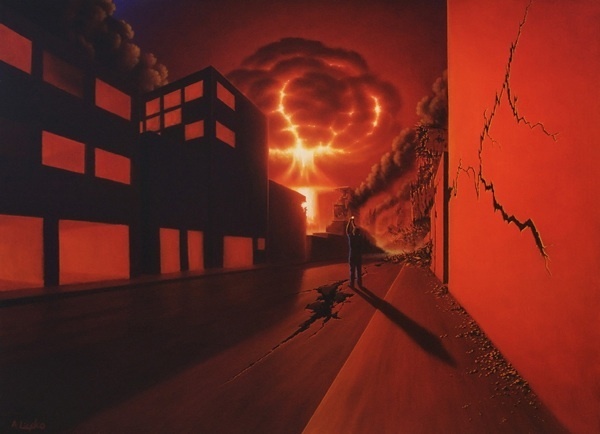 which depicts a man on a city street who's so intent on taking a smartphone photo of the mushroom cloud ahead that he's missing the whole point, that nuclear devastation is underway. "In 'OMG-LOL!' the man is so lost in the technology, so rushed to get an awesome pic to post to Facebook or Twitter that he's oblivious to the reality that his world is about to end. It reminds me of that Three Stooges skit -- 'Hey! Wake up and go to sleep!' -- because as awesome as our handheld technology is, let's not fall asleep to what is going on around us! The accumulation of information is not the same as knowledge and understanding." We segue over to this theme that as much as we think we've evolved with our scientific and technological advances, that we may actually be devolving as humans. There was a report from Kyoto University researchers that young chimps have an "extraordinary" ability to remember numbers that's superior to that of human adults. So like when was the last time you did do a percentage equation in your head? Hello, apparently Cheeta does it better! Some scientists in Scientific American have suggested that humanity might actually be becoming less intelligent and more physically flawed as the result of evolution, with problems such as ADD and other conditions possibly spreading throughout our populus. Others have also questioned how "automation addiction" is causing its own problems. For example, it's suggested that auto-pilot features and systems on commercial jets are making pilots less capable of dealing with emergency mechanical failures. Ain't that encouraging! And if you've been wondering about distracted drivers on our freeways, The New Atlantis has questioned whether in-car GPS systems, because they separate the acts of driving and navigating, are actually making us worse drivers. I know, right! Thing is, we love our tablets, smartphones and laptops. As futurist Marshall McLuhan had presciently predicted in his tagline "reach out and touch someone," we really are communicating more and with more people in the digital world. But at what price -- watching two hip-looking couples sitting at a table for four, each totally engrossed in their own smartphone and not one of them speaking for 15 minutes? Caveat emptor. Now excuse me, I got to rush out and catch that yellow traffic light to shoot a pic to share on Instagram of that killer sunset.